All Tabernacle homes currently listed for sale in Tabernacle as of 04/20/2019 are shown below. You can change the search criteria at any time by pressing the 'Change Search' button below. If you have any questions or you would like more information about any Tabernacle homes for sale or other Tabernacle real estate, please contact us and one of our knowledgeable Tabernacle REALTORS® would be pleased to assist you. 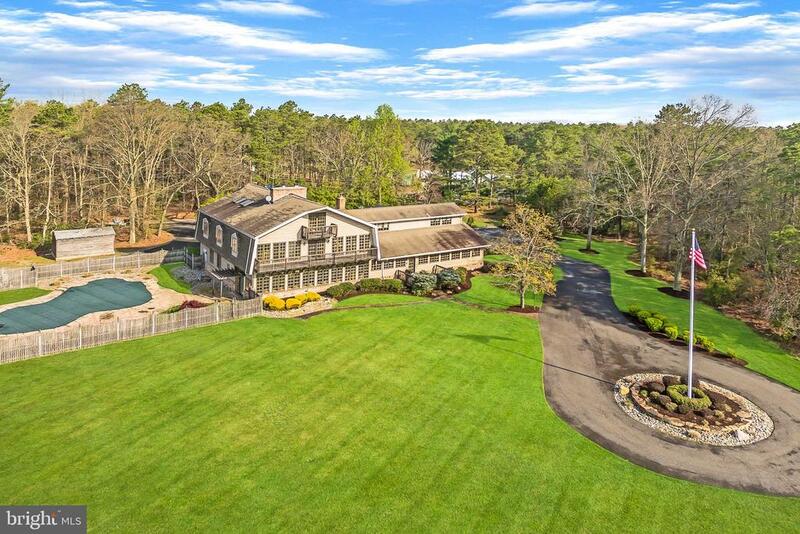 "This Stunning Custom Estate sits on 49 private acres. It combines the best of privacy, incredible indoor space and expansive acreage. 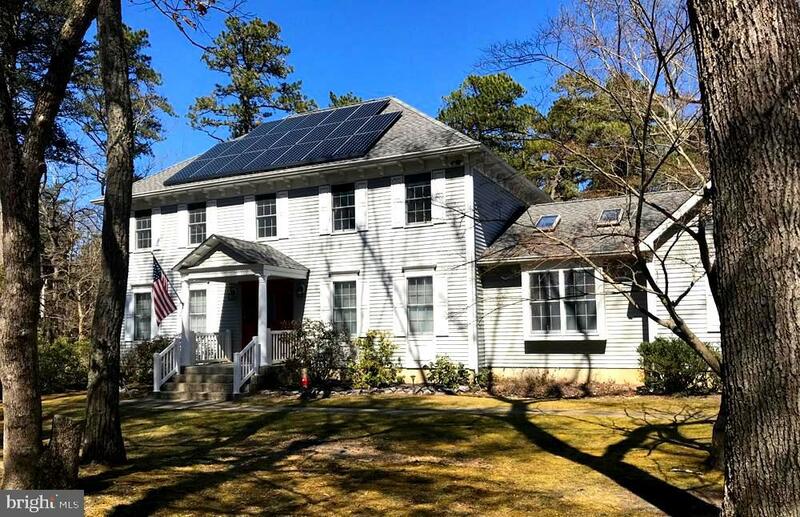 Sitting at The Head of Wading River, this home is truly something to see. Drive up to the circular drive-way overlooking the gorgeous grounds. Enter into the massive kitchen with beautiful Oak Hardwood floors, exposed cedar rafters and ceiling. This space is open to the family room with a gorgeous brick fireplace. Step down into the huge Great Room with a soaring ceiling, another brick fireplace that extends to the ceiling that is all surrounded by windows. On the upper level loft area, there is another large area for entertaining that is complete with a Wet bar and another brick fireplace. The outdoor space adds to an entertainers dream complete with an inground pool. Please see the aerial video and interior video to experience all this estate has to offer. Set up your private showing today, you will be amazed." 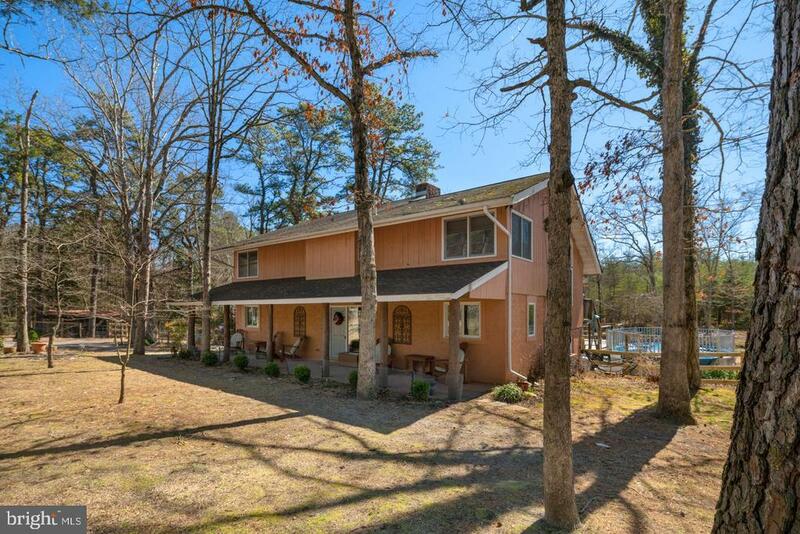 "This home's serene location on 5.42 acres, its picturesque landscape, & beautiful amenities are sure to impress! Curb appeal is a 10 with a private winding driveway, 6' wide, wrap-around porch across the front, vinyl siding & mature trees surrounding the entire property. Inside you'll fall in love with the fabulous open floorplan on the main level. Living, Dining & Kitchen are all open to one another, tastefully appointed, w/ample natural light & gleaming hardwood floors. The kitchen boasts Brookhaven cabinetry, granite counters, a SS appliance package, center island w/seating, & modern lighting. There's plenty of room to entertain in the dining area which opens to the expansive backyard deck, through oversized sliding glass doors, making dining al fresco a breeze! Keep the cook company in the adjacent living room which offers a wood-burning fireplace, hardwood floor detail, & large bay window. Continue to the main floor's master suite, currently being used as an office; possible in-law option as well. This large space is highlighted by its neutral carpeting, private full bath, 10'x6' walk-in closet, & separate sliders to the rear deck. A lovely powder room, & main floor laundry room complete the first floor. The upstairs features birch hardwood flooring throughout. This home~s second master suite is a delightful retreat w/vaulted ceiling, a private balcony overlooking the park-like backyard, an en suite bath, & two closets for storage. Bedrooms 3 & 4 are both nicely sized w/double closets & ceiling fans, and an updated hall bath nearby. A generous amount of finished basement space is extremely versatile with areas currently being used as a rec room w/dry bar, exercise room, sitting room, and more. The 500 sq. ft. of unfinished area is fantastic for off-season storage also w/bilco doors to the side yard. Now, how about that backyard?! Absolutely gorgeous! The deck is newer (installed 2017) & gives you 672 sq. feet of outdoor living space. 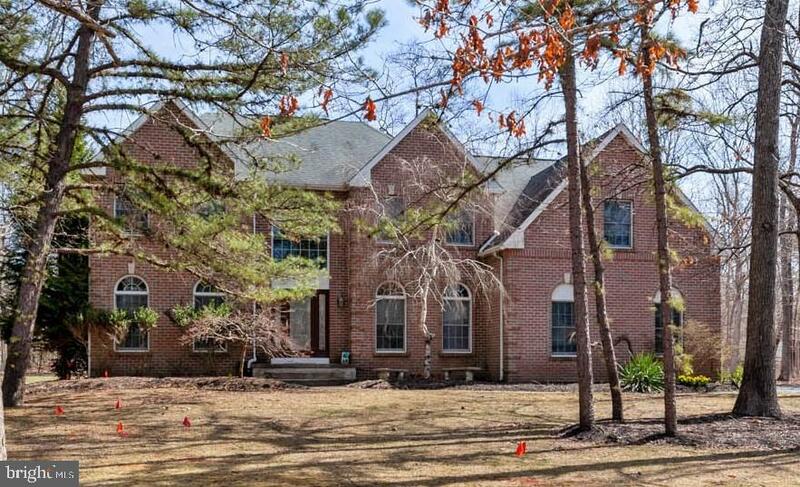 Enjoy summer soirees in you"
"Setback off the road, in a cul-de-sac, situated among tall mature trees sits this beautiful 2 story brick front home. 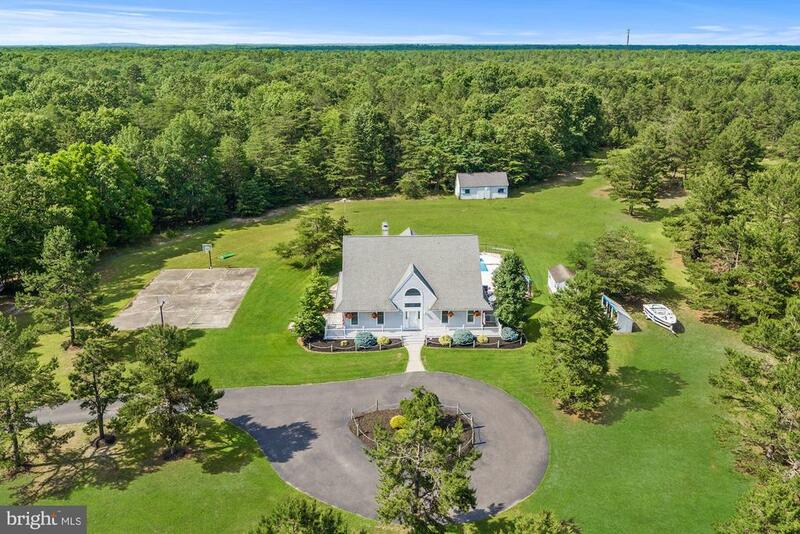 This customized elegant contemporary colonial sits on 6.4 acres of mostly wooded lot providing optimal seclusion and privacy. This property boasts hardwood floors, a tranquil view and large bright spaces. The main entrance has a large Palladian window topped with a half circle window and new frosted glass front door with dual side panels. A large palladium window allows light to flood in on the 2 story foyer and bridge-way which overlooks the family room with central fireplace. This custom home in the Pinelands has a formal dining room, with ample room for large gatherings. The sitting room is perfect for reading or playing music. A triple French door connects the kitchen, equipped with new appliances, to the deck and the outdoors. The kitchen has bright white cabinets and new appliances: stainless steel refrigerator, stove, microwave and dishwasher. The large, two-level Azek deck, overlooking the park-like backyard, is ideal for relaxing and outdoor entertaining. There are four over-sized bedrooms on the second floor and one on the main floor which is perfect as a guest/au pair room. The massive master bedroom suite with a vaulted ceiling, contains a full bathroom with Jacuzzi, walk in closet and a separate office/workout area. There are also three full bathrooms in the main areas and a full bathroom in the fully finished basement. Living here you are within the Tabernacle school district and you have two parks and playgrounds in the township. Enjoy Historic downtown Tabernacle which hosts Russo's Farms, a great place to pick up fresh fruits and vegetables as well as pick your own apples, peaches and pumpkins. A Murphy's Market and CVS Pharmacy are located in Tabernacle. Nearby Medford has a wide variety of restaurants and services as well. Don~t miss out! Schedule your appointment today!" "Rockwell Custom welcomes you to SENECA RESERVE. A Stunning custom home community with 49 homes on 1+acre wooded homesites. 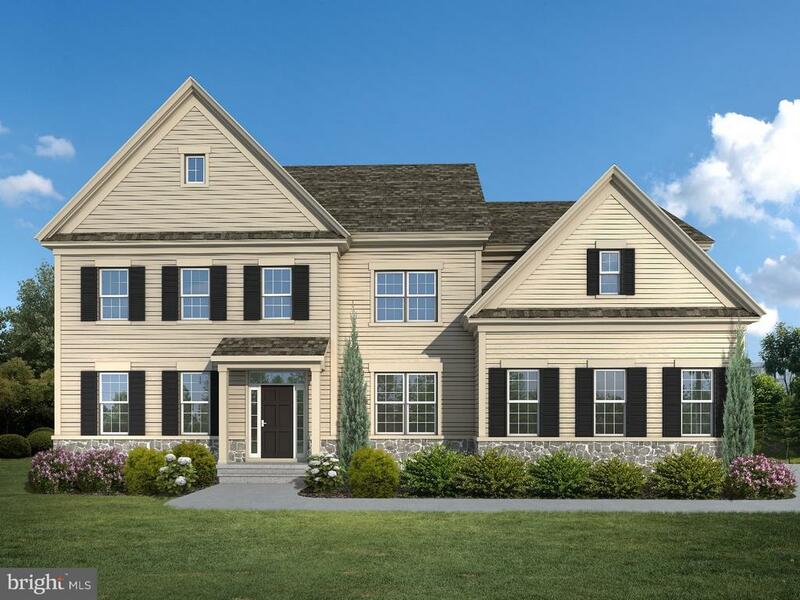 Tabernacle's new custom home community located in the heart of Burlington County, Lenape School Districts and ideally located just minutes from major roadways and schools! The PEMBROOKE will offer 9 foot ceilings on the main level, elegant Two-story Entry Foyer with beautiful split staircase separating the Formal Living Room and Dining Room, Breakfast Area in Kitchen opening to the amazing Two-Story Spacious Great Room and Study. Mudroom and Laundry Room located off garage entrance provides for convenience for every day life. Upstairs features a magnificent Owners Suite with Sitting Area, Luxurious Bath and two large Walk-in closets along with 3 Spacious Bedrooms. The PEMBROOK Includes Exceptional features such as 2 car side entry garage, unfinished basement with 9 foot ceilings, Hardwood floors in the Foyer, Kitchen and first floor Powder Room, Bathrooms will include 12x12 tile,and Kitchen will have 42cabinets, granite countertops and Stainless Steel Appliances. The PEMBROOK can be customized and expanded to fit your needs with choices such as Finished Basement, Jack and JillBath on 2nd Floor, 3 car side entry garage and many more. All photos are solely for illustrative purposes. ** Visit Rockwell Custom Website for more Information **"
"Custom Southern Colonial Home sits on 3.23 acres, dining room w/hardwood floors and French doors. Built in custom bookcases for study also with French doors. Custom Hickory Cabinets in kitchen with center-island, eat-in-kitchen with open concept to full sandstone wood burning fireplace den. Oversized master bedroom w/whirlpool tub, walk-in closet. Full basement w/entrance to oversized 2 car garage. Plus additional attached 2.5 car garage 22 x 24ft with oversized (5th bedroom) with 11 x 22 room. Game room for entertaining with oversized deck leading to new hot tub for entertaining family and friends. Enjoy your peaceful nights on this secluded lot in the northwestern Pinelands. Excellent schools, excellent neighbors and a car enthusiast/hobbyist dream with parking for 4 classic cars with a 9K lbs lift! Great school system, solar panels, game room and hot tub!" "This Homestead is Jaw Dropping, Amazing, Rare, Beautiful, Well Kept, Upgraded and would certainly qualify as A Private Oasis! Turn into your Stoned and Graded Private Driveway with Automatic Post Lighting and Be Delighted To see This Outstanding Home! Situated on a Dead End Street with Nearly 4 and a Third Acres of Scenic Property that Boasts Tranquil Views All Around! Other Exterior Features Include, Wide Cedar Plank Siding, Newer Windows and Doors that meet Energy Star Rating, Newer Roof, Electronically controlled landscaping irrigation system to keep all of the Professionally Placed Perennials looking their Finest, Invisible fence system (for your pet) around nearly 2 full acres, a Natural gas supplied stainless steel Bar-B-Que grill and A large Deck with a Hot Tub to Relax in and Look at the Stars! Two sheds, one with electric and lighting, EP Henry Walk Ways, A Newer Septic System and Leach Field Were Installed at the End of 2013 that Meet Todays Codes. A State of the Art Security System is Set in Place, Including Security day/night vision cameras and a DVR, Security alarm system and Motion activated flood lights around entire house!........ Lets Talk about the Interior~. It~s A Definite WOW!!!!! Spacious and Airy Floor Plan, Open Upper And Lower Staircases, There~s Not a Small Room in this House! Soaring Ceilings, Upgraded Flooring, A Full Wall Of Windows and A French Door in The Family Room at the Back Of The Home Offers Tremendous 24/7 Priceless Views! Family Room Also Boasts A Full Wall Stone Gas Fireplace, Turn it On, Get Warm And Watch The Snow Falling! Newer 2 Zone Central Air and Heating System with Humidifier and a Cutting Edge Water softener / conditioner with UV water disinfection system! Nothing Has been Over Looked In this Home, If The Electric Goes Out you~ll Be Fine With Your 2018 22 KW Generac fully automatic whole house generator, which includes an automatic transfer switch and Wi-Fi enabled communications! What More Can I say? Neutral Colo"
"WOW, WHAT A BUY! Opportunities like this are RARE?This is a Gold Seal Home ? All inspections were done including home, termite, well, septic & even an appraisal and this home is listed under the appraised value! 2 Hunters Lane can be a quick delivery for the discerning buyer. Located in Tabernacle in the community of Eagles Mere the curb appeal is exceptional with its stately brick elevation, lush lawns and front porch that only hint to the exciting interior. Built by Oscar Olt, this home boasts nearly 4,000 square feet of living space on the 1st & 2nd levels with an additional 1,428 square feet in the walkout basement with only the finest in quality finishes & appointments. As you enter into the foyer, take note of the gleaming hardwood floors which are found throughout most of the 1st and 2nd floor levels. The walls are painted in neutral tones, the windows are Andersen & there is extensive millwork throughout. To the left of the foyer is the living room featuring a gas fireplace with French doors to the kitchen. To the right of the foyer is the dining room overlooking the front grounds and is adjacent to the kitchen. 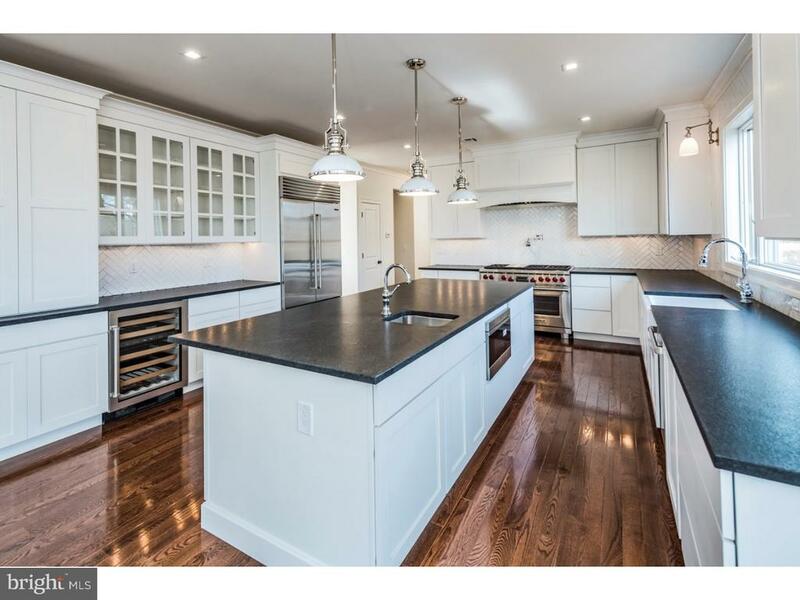 The kitchen is huge and boasts abundant cherry cabinets, granite counters, extensive recessed lighting & faux painted walls with brick accents and a full appliance pkg. Step down to the 31 x 32 family room with 2nd gas fireplace and note the attractive floor to ceiling windows with circle tops overlooking the 45'x16' deck, rear grounds, inground pool & basketball court. A passage door off the kitchen leads to the laundry room (washer & dryer incl.) along with a powder room. The yard is fully fenced, the lawns are lush and the specimen plantings are exceptional. Ascend to the 2nd floor where there are a total of five bedrooms - the master bedroom ensuite and 4 additional bedrooms. The master bedroom is exceptional and features a huge closet fitted out with organizers. A door leads to the upper walkway for easy access for holiday decorating. The mas"
"Opportunity only knocks once in a while and when it does answer it! This property is one of those instances. Beautiful, custom built home on 3+ acres with a barn/stable, fenced pastures and wide open space is now available for a new owner. Drive up to the house and notice the well maintained neighborhood of upscale estate homes. As you enter the house imagine the peace and tranqulity that awaits you. The flow of the house allows for privacy and wonderful entertaining spaces. Notice the large 2 story foyer withdramatic staircase, hardwood floors and a view to the back. On your left is the dining room and the living room is on the right. Straight ahead is the open living space with large kitchen, convenient breakfast room and a gathering room with fireplace. There is a sliding door to the deck and also a covered porch off the laundry room area. A half bath and back foyer for all of your boots and coats is perfectly situated. Upstairs are 3 large bedrooms, a hall bath and a private master suite with walk in closet, elegant bath and room for all of your furniture. The property features a full basement that could be finished for more space or use for storage. Look out your windows and enjoy the open space provided by a house with acreage. Sit on the porch or deck and watch the horses graze in the pasture. A convenient barn/stable is designed for maximum use including a tack room, four stalls and a hay/feed room. The stable and pastures could provide extra income for boarding horses. Everything about this property has been well maintained by the original owner. Are you ready to make the move to peace and quiet? Schedule your appointment today to view this house for yourself." "Rockwell Custom welcomes you to SENECA RESERVE. A Stunning custom home community with 49 homes on 1+acre wooded homesites. Tabernacle's new custom home community located in the heart of Burlington County, Lenape School District and ideally located just minutes from major roadways and schools! The ELMSGATE will offer 9 foot ceilings on the main level, Formal Living Room, Eat in Kitchen with walk-in pantry and a spacious Great Room. Drop Zone space off garage entrance provides convenience for every day life tasks. Upstairs features a magnificent Owners Suite with Sitting Area, Luxury Bath and two large walk-in closets along with 3 spacious bedrooms with large closet space. The ELMSGATE Includes Exceptional features such as 2 car side entry garage, unfinished basement with 9 foot ceilings, Hardwood floors in the Foyer, Kitchen and first floor Powder Room, Bathrooms will include 12x12 tile and Kitchen will have 42cabinets, granite countertops and Stainless Steel Appliances in the kitchen. 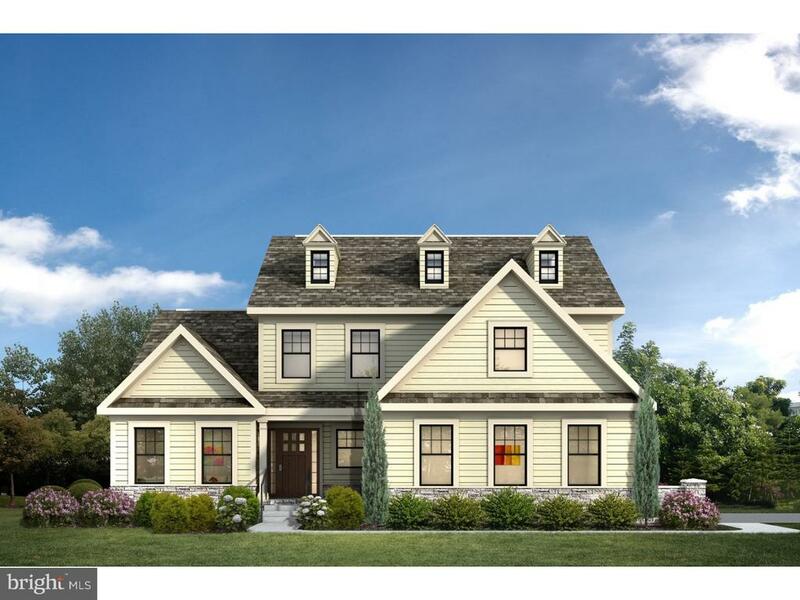 The ELMSGATE can be customized and expanded to fit your needs with choices such as Morning Room, Finished Basement, Jack and Jill Bath on 2nd Floor, or Fifth Bedroom, Third Floor Attic/Bedroom with Bath, 3 car side entry garage and much more. All photos are solely for illustrative purposes. ** Visit Rockwell Custom Website for more information **50% off buyer options up to $40,000"
"Come out and take a look at your new home! Many NEW Upgrades!!! 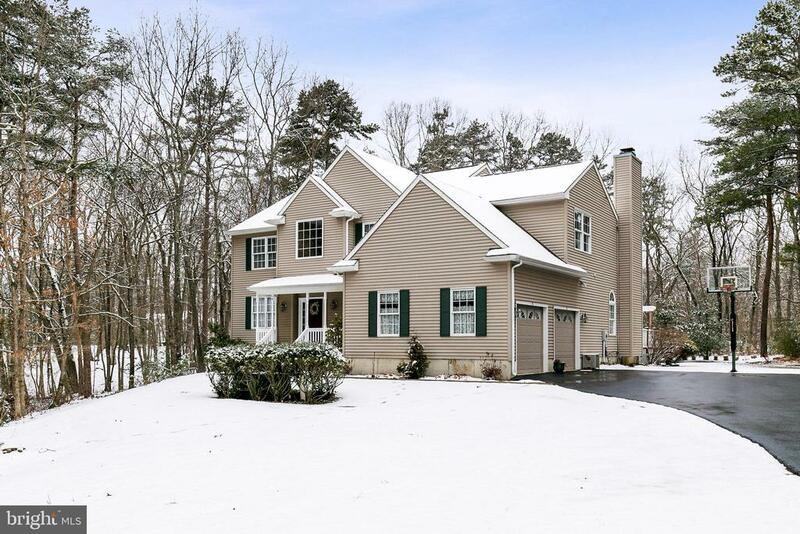 This beautiful Colonial features 4 large bedrooms, 3 full and one half bath on almost 4 acres. Drive onto your large, circular driveway with an abundance of parking. Upon making your way to the home, there is a small pond, and comfortable front porch for relaxing. The porch posts have been replaced with vinyl for easy care living. Enter your home through the New front door with key-less entry. Most of the flooring on the first level has been replaced with durable, easy care flooring; freshly painted throughout, and New fixtures and Custom Blinds. The Living Room has a gas fireplace and ceiling fan and leads to Dining Room with Hardwood Flooring. The kitchen boasts New Granite Counter-tops and Tile Back-splash, New deep sink, New Stainless Steel appliances, tile flooring, pantry and fixtures. There is a large eating area and sliding door to your private back yard which features stamped patio, Bilco doors, and concrete walkway with with 4 light posts to illuminate your way to your in ground pool. The pool is fenced and has a concrete walkway, landscaping and there is a pool house which keeps your pool equipment, filter and changing area. There is an additional garage and vinyl fencing out back for all of your storage needs. Back inside, the large Family Room has plenty of windows, ~ bath, Entrance to Large Laundry/Mud Room with side door and access to the freshly painted 2 car garage. Upstairs is a Large Master Bedroom with Walk In Closet, Ceiling Fan with light, and Master Bath which has been upgraded and includes a large jetted tub with separate stall shower and double sink with vanity. The other 3 bedrooms are nice size. All have been freshly painted with new carpet, custom blinds, ceiling fans and ample closet space. There is even more storage in the partially floored attic with pull down stairs. Not included in the almost 3000 square feet of living space is the finished basemen"
"Natural wooded abundance in a quiet setting, yet close to the shore, mountains and nestled in an area of upcoming businesses and great schools. A Home for Living. Situated on 9+ Acres, privacy is the rule. Originally built by contractor for his own home, this 2,888 sf home is unique in so many respects. 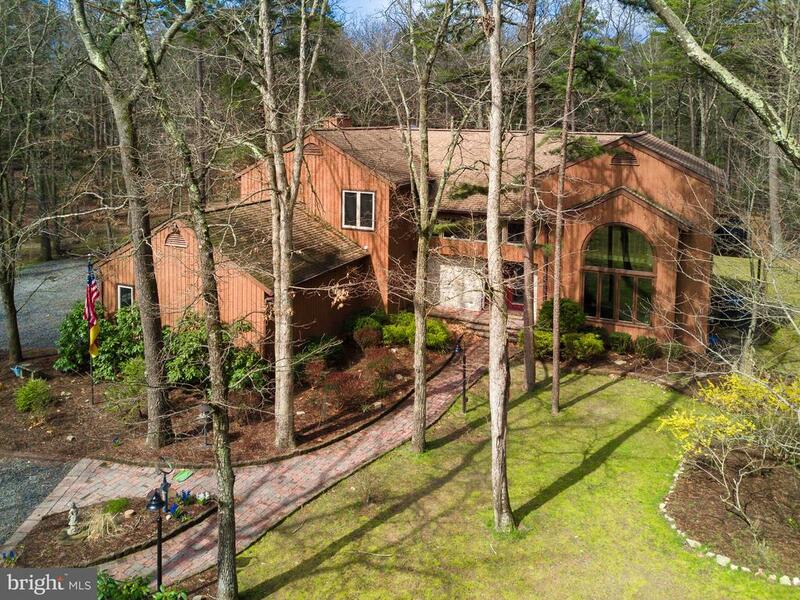 Enter through the Glass surrounded foyer and be taken aback by the full height 28' great/gathering room with a gorgeous floor to ceiling sand stone fireplace. Step down into the great room seating area and be warm by the fireplace, while others enjoy relaxing in the adjoining gathering room. Join those seated in huge eat in kitchen or if more formal, serve in the large dining room. So much glass that light comes from everywhere! First level has 2 large bedrooms for those living with you, but the recently painted upper level master suite is reserved for you. With large walk-in closet (double tiered) and adjoining renovated master bath with double sinks, shower stall and whirlpool tub, the end of the day can be just the beginning. Other details, alarm system, hardwood floors in GR/FR/DR/Foyer, Tile in Kitchen & Baths, Carpet in Bedrooms, with Newly Install Carpet in Master. Ceiling Fans in all Rooms, Oversized 24x32 garage with walk up attic storage room, Partially finished basement with plenty of additional storage & outside access door & setup for generator connection. BUT, the piece de resistance is the 1750 SF converted outbuilding, with Heat & Air Conditioning, that provides an place to operate a home based business with 750 SF area having full bathroom and kitchen facilities and a 1000 SF area for storage/workshop or garage for toys. Subject to approvals, could accommodate in-laws, au pair or an additional income. Plenty of space for horse barn, it is so close you can walk or ride to the Wharton Tract, in minutes. IF you need it bigger, architect plans for 4th bedroom addition are included. Great Place, Great Price, see it Buy It!! Flexibility on Occupancy, avai"
"Rockwell Custom welcomes you to SENECA RESERVE. A Stunning custom home community with 49 homes on 1+ acre wooded homesites. 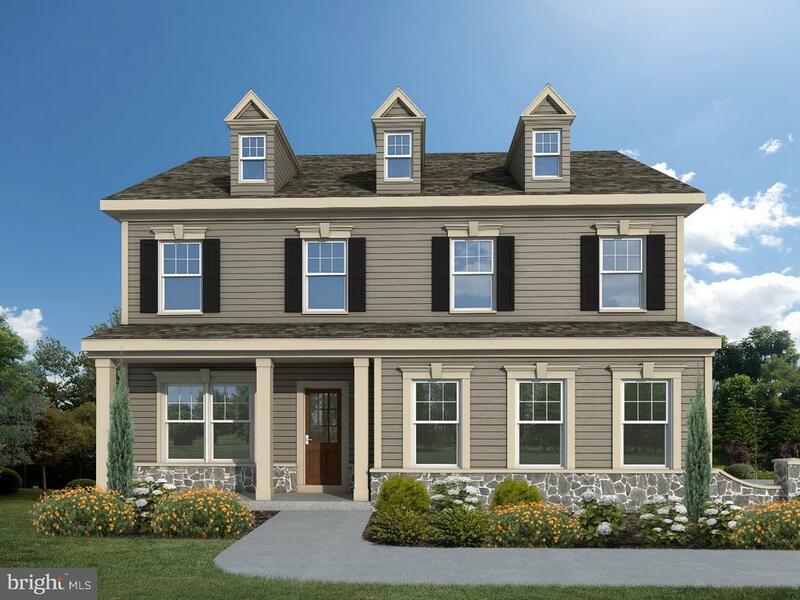 Tabernacle's new custom home community located in the heart of Burlington County, Lenape School District and ideally located just minutes from major roadways and schools! The BROOKVALE will offer a beautiful FIRST FLOOR OWNER'S SUITE with Luxury Bath and large walk-in closet. 9 foot ceilings on the main level, Study, Breakfast Area in Kitchen with large kitchen island that is an integral part of the expansive Great Room. Mudroom and Laundry Room located right off garage entrance completes this convenient First Floor Living space. Upstairs features 2 additional spacious bedrooms, Loft with Bath and Unfinished Storage area. The BROOKVALE Includes Exceptional features such as 2 car side entry garage, unfinished basement with 9 foot ceilings, Hardwood floors in the Foyer, Kitchen and first floor Powder rRom, Bathrooms will have 12x12 tile and Kitchen will have 42cabinets, granite countertops and Stainless Steel Appliances in the kitchen. The BROOKVALE can be customized to fit your needs with choices such as Finished Basement, A Second FirstFloor Bedroom in lieu of Study, 2nd Floor Princess Suite or 3 car side entry garage and many more. All photos are solely for illustrative purposes. ** Visit Rockwell Custom Website **50% off buyer options up to $40,000"
"Rockwell Custom welcomes you to SENECA RESERVE. A Stunning custom home custom home community with 49 homes on 1+ acre wooded homesites. Tabernacle's New custom home community located in the heart of Burlington County, Lenape School District and ideally located just minutes from major roadways and schools! The OAKMONT will offer 9 foot ceilings on the main level, Formal Living and Dining Room, Eat in Kitchen and a spacious Great Room. Upstairs features a magnificent Owners Suite with two large walk -in closets along with 3 spacious bedrooms with large closet space and Upstairs Laundry Room. The OAKMONT Includes Exceptional features such as 2 car side entry garage, unfinished basement with 9' ceilings, Hardwood floors in the Foyer, Kitchen and first floor Powder Room, Bathrooms will include 12x12 tile and the Kitchen will have 42cabinets, granite countertops and Stainless Steel Appliances. The OAKMONT can be customized to fit your needs with choices such as Morning Room, Finished Basement, Attic Loft with Bath, 3 car side entry garage and many more. All photos are solely for illustrative purposes. ** For more information please visit Rockwell Custom Website **50% off buyer options up to $40,000"
"Short sale approved on this Spectacular home in Michaelsons Woods!!!! 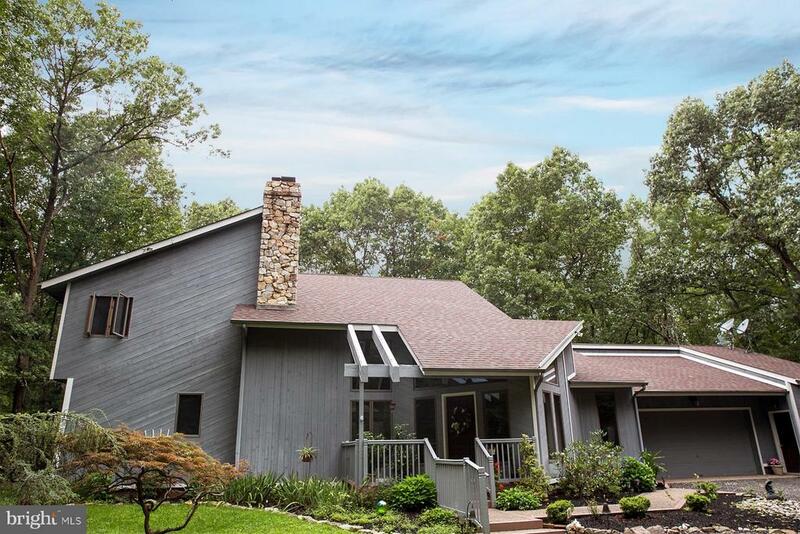 This home features four bedrooms, three and a half baths, 9 ft ceilings throughout. Upon entering the grand foyer, a sweeping staircase captures your attention. Off the foyer are the home's more formal spaces. 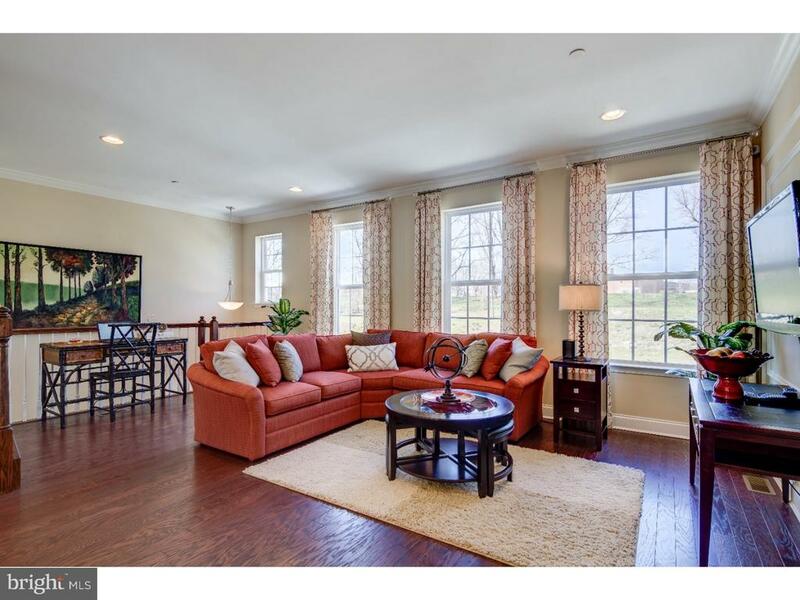 Family room is breathtaking, features a wall of windows and a gas fireplace. Chefs Kitchen with top of the line cabinetry, Gorgeous hanging spot lights, recessed lighting through out. Stainless steel appliances including a double wall oven. The main level is completed with an Office/Library. Upstairs you will find four large bedrooms including a master suite which boasts a private sitting room, walk-in closets and a beautifully tiled master bathroom complete with two vanities, a water closet garden soaking tub and stall shower. The unfinished basement with sliding glass door walk-up to the backyard offers endless possibilities. This home has newer windows. Property to be sold AS IS; Buyers to be responsible for any and all inspections/certifications including Certificate of Occupancy and Well test. Pack your bags and move in !!!!" 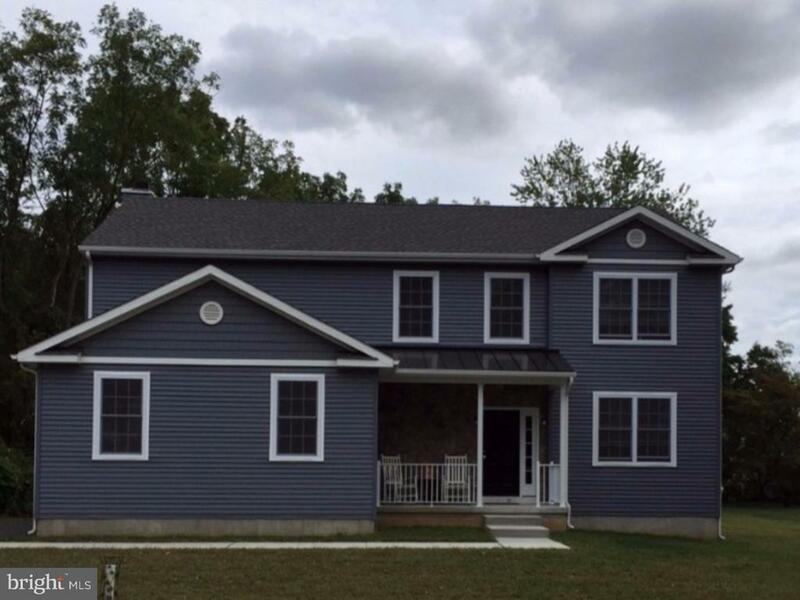 "BETTER THAN NEW CONSTRUCTION~ INCLUDES ALL THE UPGRADES AT NO EXTRA COST!!! Including finished walk-out basement, 3.5 baths, 2-zone HVAC, hardwood flooring, granite countertops, stainless steel appliances, Trex-style deck and more. 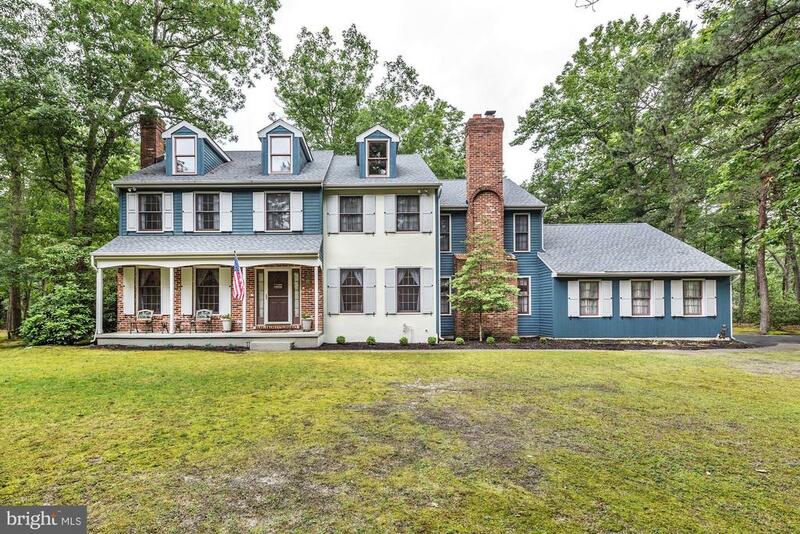 You'll be impressed by the quality craftsmanship of this stunning custom 2-story colonial situated on a 1.47 acre private wooded lot which boasts large room sizes, 2-story foyer and family room, finished walkout basement and much more. As you approach, notice the private setting and covered front porch. Enter the soaring 2-story foyer with turned staircase and hardwood flooring which flows throughout the entire main level. Flanking the foyer are the formal living room with gas fireplace and private office/study. The well-equipped gourmet kitchen boasts 42~ cabinets, granite counter tops, stone backsplash, stainless steel appliances including built-in microwave, large food prep island with seating for three, wet bar and desk area. The triple Bay window allows for plenty of natural sunlight. The dining room is conveniently located adjacent to the kitchen and boasts custom moldings, wainscoting and pocket door for privacy from the living room. The focal point of the family room is the wood-burning fireplace with stone surround. Features include soaring cathedral ceilings, private rear staircase and 4-panel French doors leading to the rear Trex-style deck with vinyl railings and private rear grounds. A storage shed here adds additional storage space. The laundry room includes the washer & dryer, utility sink, upper storage cabinets and access to the 2-car garage. Main level features include 9' ceilings, freshly painted trim, moldings and wainscoting. The walls have also been tastefully painted in neutral tones throughout. Descend to the finished lower level where you~ll find a game room with bar area, media room, full bathroom and plenty of storage space. Additional features here include 10' ceilings, plenty of recessed lighti"
"Loaded with OPTIONS. Granite Kitchen countertops, ceramic/wood flooring, etc. Build the popular Cedar Brook Model, featuring 2,800 Sf. 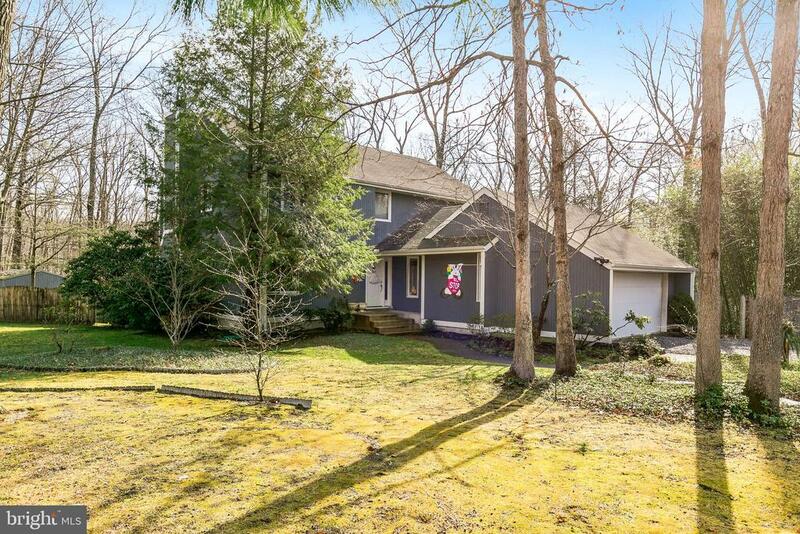 of well designed living space, a full, poured concrete basement, and a beautiful 3.22 acre lot, nestled in a cul de sac among other beautiful homes. This home has a cozy front porch. The purchaser will chose all the interior and exterior finishes and customize to meet their needs and desires. Visit GNE's showroom located 29 minutes from the site. Bring your purchaser's and we'll do the rest. There are many models to pick from as well. Bring your own plans and we can price them for you also. Tons of flexibility when designing your own home. Property backs up to a creek, down back in the woods. Beautiful site." 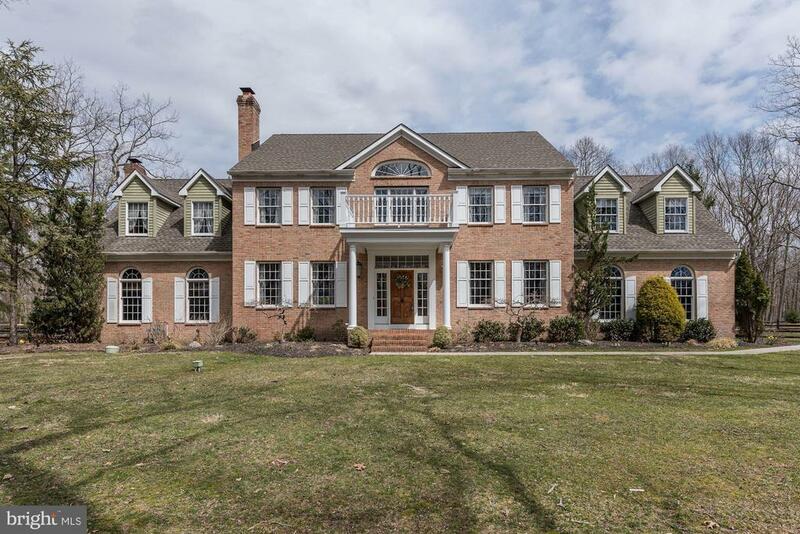 "New Listing, Tabernacle N J, Welcome to this charming, traditional center hall colonial with two additional bonus areas in desirable Eagles Mere, the best kept secret in South Jersey. Quiet CUL-DE-SAC location on a private, wooded lot set back from the street. The New Fairfield model home, boasts 3,450 sq. ft. of living space, with covered porches at the front and side of the home, and a large deck just off the Gathering Room overlooking the in-ground Pool and the serene back yard, There are (2) two wood burning Brick Fireplaces, one located in the Living Room and the second in the Gathering Room. The formal areas of the first floor have Oak Hardwood floors and the foyer and the kitchen have tile floors. As you enter the Foyer, the focal point is the Oak stained staircase, trim and crown molding. To the left is the formal Living Room with Oak Stained Hardwood floors, crown molding and a brick fireplace. To the right is the formal Dining Room with Oak Stained Hardwood floors, double French doors, crown molding, chair rail, and an abundance of natural light thanks to the oversized windows on two sides of the room. Enter the spacious Kitchen and Breakfast space with tile floors, a Granite top Center Island, Granite counters and wall backsplash throughout the abundant kitchen cabinets, with an undermount double stainless steel kitchen sink and (3) three windows overlooking the large Pool and the back yard. Large breakfast area has room for a full size table with four windows overlooking the large back yard for tranquil views of the woods. All kitchen appliances are included. There is also a first floor powder room. A large built in pantry connects to the Kitchen through the passageway to the Dining Room. To the left of the Kitchen is a large formal Study with Oak stained hardwood floors, chair rail, crown molding, lighted ceiling fan, and bay window. To the right of the kitchen, you enter into the Gathering room, with Oak stained hardwood floors, a floor to ceil"
"Rockwell Custom welcomes you to SENECA RESERVE. A stunning custom home community with 49 homes on 1+ acre wooded homesites. Tabernacle's new custom home community located in the heart of Burlington County, Lenape School District and ideally located just minutes from major roadways and schools! The EDGEWOOD will offer 9 foot ceilings on the main level, Formal Living Room, Eat in Kitchen and a Spacious Great Room. Upstairs features a magnificent Owners Suite with Luxury Bath and large walk-in closet along with 3 spacious bedrooms with large closet space and Upstairs Laundry Room. The EDGEWOOD Includes Exceptional features such as 2 car side entry garage, unfinished basement with 9' ceilings, Hardwood floors in the Foyer, Kitchen and first floor Powder Room. Bathrooms will include 12x12 tile and the Kitchen will have 42cabinets, granite countertops and Stainless Steel Appliances. The EDGEWOOD can be customized to fit your needs with choices such as Morning Room, Finished Basement, Third Floor Attic or Bedroom, 3 Car Side Entry Garage and many more.All photos are solely for illustrative purposes. ** For more information please visit Rockwell Custom Website **50% off buyer options up to $40,000"
"Bring your animals and your love of nature to this spacious, updated 4 bed, 2 bath home on over 4 acres in Tabernacle. This home and property have so much to offer that you'll never want to leave! Beginning with the fully fenced grounds, the 4-stall stable has electricity and running water as well as a large 200-bale capacity hay loft. Turn out your horses in one of the multiple paddocks or take them for a ride on the property's trails. The chicken coop offers the opportunity to enjoy fresh eggs every morning from your own hens. A small animal hut completes the livestock outbuildings. Relax to the sound of water from the new aerator fountain in your spring-fed pond where you'll often find wildlife like frogs, fish, and otters. The expansive rear deck overlooks the pond and leads to the above-ground pool. This is a great space to host BBQs and pool parties or just to unwind in the quiet. Looking for some high-flying fun? You will be the envy of the neighborhood with your very own zip line! Let's head into the home now, where you will find beautiful hardwood flooring throughout, four generously sized bedrooms, a large laundry room, and updated kitchen and baths. Enter into the foyer from the rustic style front porch. The entry level offers a bedroom and a large office/laundry room. Fulfill your competitive streak in the lower-level game room with its billiards and foosball tables. This room also offers access to the back yard. On the main level is the huge family room with a 2-story vaulted ceiling and full-wall stone wood-burning fireplace. Everyone will want to gather in this inviting space where you can also access the rear awning-covered deck via sliders. Adjacent to the family room is the updated eat-in kitchen which boasts granite counters, ample cabinet space and an island with additional seating. The dining area has views of the yard and pond as well as entry to the rear deck for ease of entertaining. There are two bedroom levels, the first offering 2 sizeabl"
"Horses welcomed!! Truly a rare find! Come and view this 3 bedroom, 2 full bath 2-story farmette nestled on 5 acres of horse country in an established area of Tabernacle. 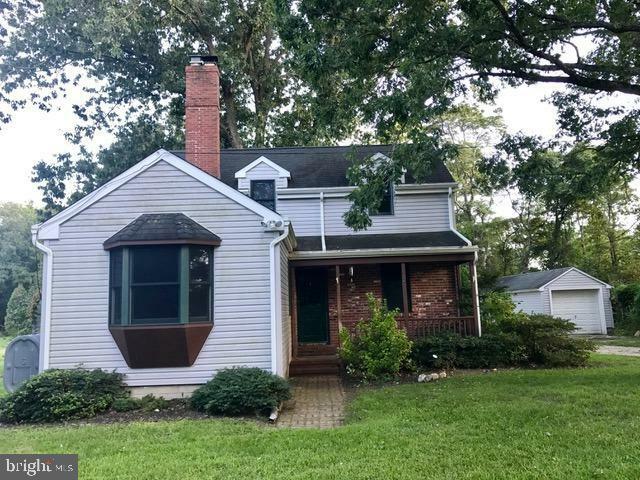 Some amenities include an updated kitchen with French Doors opening out to sunroom, dining room, living room with fireplace, full basement and recently refinished hardwood floors throughout. There are 2 barns with 12 matted stalls in the main barn. There is an outside screened porch for summer day BBQ's. The property has lots of privacy and access to riding trails. Schools are highly rated with great education and competitive sports programs." 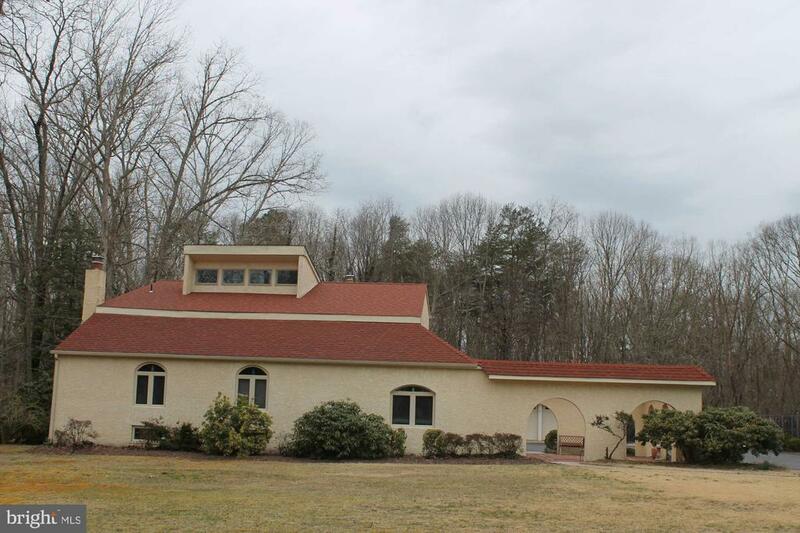 "Located in the established community of Tabernacle! This home which offers an open floor plan and so much light, both natural and recessed! The original home was built in 1948 and since that time, the owners have made significant expansions. 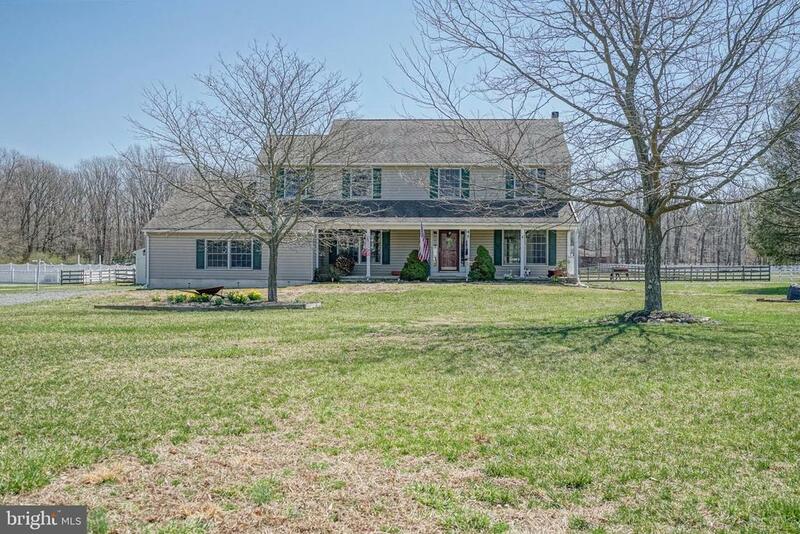 You are invited to tour this 4 bedroom, 2 full bath multi level home situated on 2 acres. Enter through the side door into the tiled foyer. At this entrance there is a full kitchen, which offers gas cooking, dishwasher and a breakfast bar. Then step down to a spacious family room with vaulted ceiling, ceiling fan, recessed lighting, wood laminate flooring and many windows. Then step up into the dining area (an all season room) which has tiled flooring, a wood burning stove and a slider that opens onto a wood deck, which is over looking the backyard. Also located in this section is a laundry closet and a pantry. Leaving this area, you enter into the formal living room with Hardwood flooring, vaulted ceiling, skylights and French doors that open to the original court yard. Going through the Formal Living Room, you will come to another foyer which offers a staircase to a lower level bonus room. Also off of the living room down another hallway are 2 bedrooms, a main bath and entrance to the basement and also access to the crawl space. In addition there is a staircase that leads to the 1st upper level, which is where you will find the Master Bedroom which offers Hardwood flooring, a ceiling fan, walk in closet and a full bathroom. Then return to the stair case and ascend to the upper 2nd level where you will find a sitting area and a 4th bedroom. This level also has hardwood floors throughout. This home also has 2 separate heating systems. The original part of the house has oil forced air heat and the newer sections are heated by propane gas and also the newer section has central air. The property also offers a detached 8 car garage which has a separate work shop area. The front section of the garage before the work shop area has"
"Enjoy your summers poolside at your own private oasis at this wonderful home located in the desirable neighborhood of Forest Lanes. Enter into the vaulted entry with powder room, open concept living room/dining room with double sliders that leads you to the expansive decks to enjoy the surrounding nature, French doors to 1st floor bedroom/office, eat in tiled kitchen with full appliance package including new dishwasher, step down into spacious family room with vaulted ceiling, a wall of windows, wet bar and another slider with access to deck. 2nd floor consists of 3 spacious bedrooms, hall bath, master bedroom with private deck, master bath with double vanity, shower and soaking tub and walk in closet. Full heated basement which is partially finished with bedroom, storage area and additional entertainment space. Attached side entry 2 car garage with additional storage. Outdoor living at its best with an inground heated saltwater pool, shed, landscaping, lighting and irrigation system. Additional features: New gas heater(dual zone) & A/C, new hot water heater, newer septic, newer water treatment system and security system. 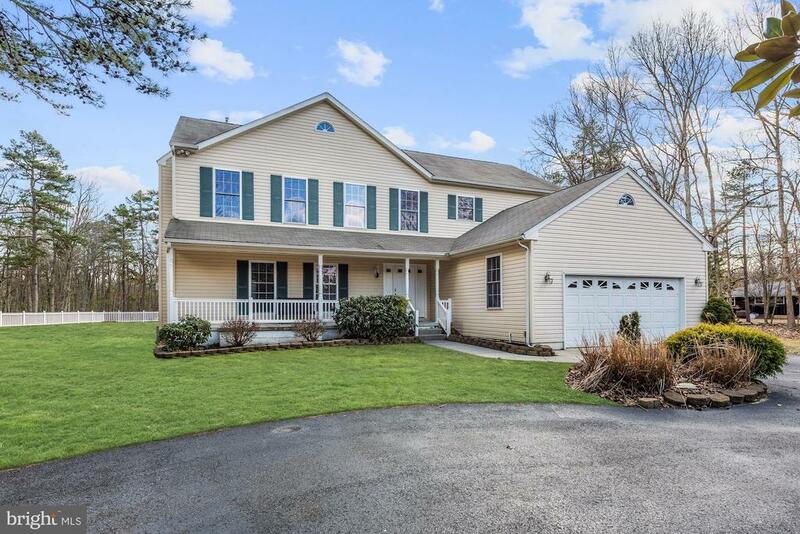 Tranquility in Tabernacle yet conveniently located by major highways and shopping."